Tom Gerrity confronted the challenges of growing older at an earlier age than most. He was 55 when he received the diagnosis of early Alzheimer's disease. "It shortened his career, took his driving away, sort of the things that we take for granted," said Peggy Bargmann, a registered nurse who is director of the Brain Fitness Club at First UMC, Winter Park. The program, started in 2007 after an appeal by Gerrity’s wife, Nancy, promotes brain-healthy activities to aid Alzheimer's patients and others diagnosed with early memory loss. First UMC, Winter Park, is seeking to share its award-winning Brain Fitness Club ministry with other churches. Contact BrainFitness@cfl.rr.com. First UMC, Homosassa, will host "Coping with Dementia," a free, one-day conference for caregivers, on Tuesday, Sept. 16. The church is located at 8831 W. Bradshaw Blvd., Homosassa. Click here for information, email administration@sgseniors.com or call Karen Kline, (352) 628-4083. The club has had such positive results that last year it received the ICAA (International Council on Active Aging) Innovators Achievement Award, which honors creativity and excellence in the active-aging industry. It is Gerrity's legacy, a gift to those who, despite their illness, want to remain active and enjoy life for as long as possible. The program is also one of several ways Florida Conference churches minister to people facing dementia and their families and caregivers. Some, like New Covenant UMC, The Villages, take music and activities to residential facilities for the memory-impaired to help stimulate their minds. Others, like First UMC, Homosassa, welcome people with dementia to activity-filled sessions on the church campus, which also provide respite for the caregivers. The Brain Fitness Club was born after Bargmann and the Gerritys met at a caregivers' support seminar and shared concerns about the lack of programs for people in the early stages of memory loss. A community needs assessment confirmed their views. When Nancy Gerrity spoke up at a church meeting about needing a home for the Brain Fitness Club, the congregation stepped forward. "It was serendipitous and everything fell into place," Bargmann said. Now Bargmann is trying to spin off the Brain Fitness Club to other churches and organizations. A grant from the Winter Park Health Foundation is funding development of a manual and "how-to" model as a guide for future clubs. Dr. Janet Whiteside, center, works with a Brain Fitness Club participant at First UMC, Winter Park. 2009 file photo by Tita Parham. First UMC, the club meets two days a week for four hours a day. One group of 16 people meets on Mondays and Thursdays; a similar group meets on Tuesdays and Fridays. There are three 14-week semesters each year with a waiting list of about a dozen people who want to sign up. Membership fees cover the club's costs. Discounts can be approved on a sliding scale based on income. Scholarships also are available. Club applicants are referred by physicians and must have a diagnosis of memory impairment, such as Alzheimer's, dementia, mild cognitive impairment or Parkinson's disease. They also must be in a treatment plan. It isn't for the "worried well" who sometimes forget where they put the car keys, Bargmann said. "They have to know they have a memory impairment," she said. "Our program is about people being able to talk with other people. You have to want to be in the program. It has to be Dad's choice." Members might be asked to read a book upside down or create a collage of words and pictures that describes their lives. They might chat with friends, play a game of ping pong, take classes in tai chi and chair yoga or stroll around the gymnasium as a pedometer clicks off their steps. Every club activity is meant to be fun. "We want them socializing and comfortable to be there," Bargmann said. "Everything we do needs to have an element of fun or a way it transitions to fun. We stress a lot of creative thinking. But there is no such thing as cheating. You can call a friend, look it up." While there are no cures for Alzheimer’s and related diseases, a growing number of research studies show mental stimulation, exercise and socialization help slow the aging process and potentially delay the progression of Alzheimer's and dementia. "People are seeking help earlier than when they used to," Bargmann says. "And people are seeing that you can do something to make your brain healthier." Volunteers from New Covenant UMC use clay sculpting to help stimulate brain activity for residents of a facility for people with dementia. Photo from New Covenant's Clare Bridge ministry. The Brain Fitness Club is supported by the University of Central Florida (UCF) and Rollins College. 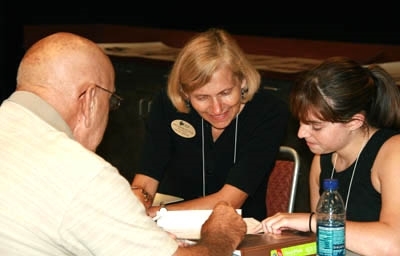 One day a week, UCF graduate students provide 30-minute one-on-one cognitive therapy for each club member under the supervision of Janet Whiteside, a UCF clinical instructor with the school's Communication Disorders Clinic. Last fall, UCF's College of Nursing also became a partner. Students from Rollins College spend time with club members at group classes. One recent session was on photography. "It was intergenerational. Our group was learning with 20-somethings," Bargmann said. Until his death last year, Gerrity was the club's "piano man," playing from a familiar song list he learned over the years. People who work with seniors say music and song often trigger memories and stimulate brain activity. At New Covenant UMC in The Villages, volunteers in the “Joy!” ministry use inspirational stories, humor, beloved hymns and well-known songs to re-establish connections to daily life. "They do a lot with music," said Marilyn Anell, director of pastoral care. "It's very stimulating to the mind. We sing songs that they grew up with, secular as well as spiritual. The memory remembers words of a song longer than it can remember words for speaking." Volunteers with the church's Alzheimer's @Clare Bridge ministry visit the Clare Bridge assisted living residence once a month for worship services. They also do sing-a-longs or tell familiar Bible stories. On occasion a karaoke group sings and encourages people to dance. "They will respond to the music and get up and dance," Anell said. Sometimes it’s a brand-new activity that creates a spark. Karen Kline, parish nurse for First UMC, Homosassa, remembered a man in the church’s Memory Lane Respite ministry that became a winner at checkers. "His wife was amazed because he didn't play checkers (before)," Kline said. "He felt he had accomplished something and was happy." Being with other people and playing games can make a difference, Kline said. Such activities are part of the church’s respite service for caregivers of Alzheimer’s patients. Offered once a week, it includes two hours of games, large Lego-style building blocks, puzzles, music and even simple tasks like folding washcloths. First UMC, Homosassa, is also hosting a one-day caregivers’ conference called “Coping with Dementia” from 10 a.m. to 2:30 p.m. Tuesday, Sept. 16. For information, click here. For free registration, call Debbie Selsavage at (352) 563-0235 or email administration@sgseniors.com. To arrange respite care for the conference, call Kline at (352) 628-4083.